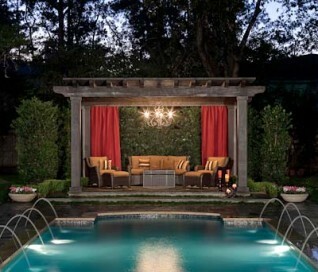 An arbor can be a simple structure for sitting underneath trees, or it can be a pinnacle of outdoor landscape design. Some arbors are simply vantage points beneath large trees from which homeowners can quietly take in a view of the surrounding Houston landscape. Others, however, are true monuments of architecture, taking on the proportion of outdoor living rooms and rising to positions of preeminence in the nighttime sky. The wood and glass arbor constructed for the Friedman family of Houston was just such a structure. 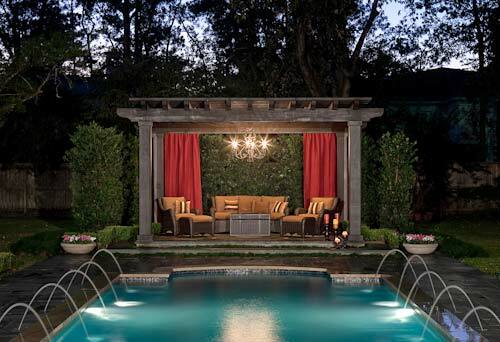 This arbor was built in the form of a formal, outdoor luxury living room. It was constructed at the end of a long, three-level sandstone patio. Its axial location in relationship to the pool made it the second most significant structure on the landscape, and the terminus of the pool and hardscape design. Anyone exiting the summer kitchen adjoined to the home interior would suddenly find themselves standing at the end of a patio that stretches past the length of a luxury pool and culminates in the grand architectural finale of an outdoor luxury living space, replete with fine furnishings and a crystal chandelier. The arbor itself is built in a style of traditional architecture with a touch of classicism. Four large pillars support a glass roof that shelters the fine furnishings beneath. 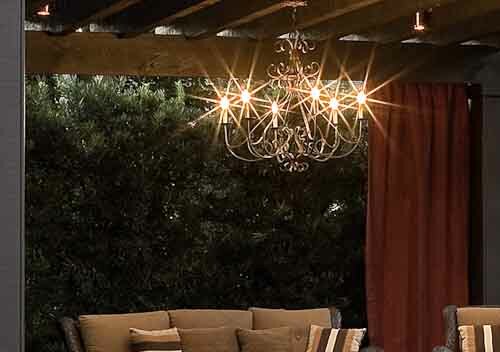 A chandelier hangs from the roof’s interior, adding drama, richness, and tone to the moment. 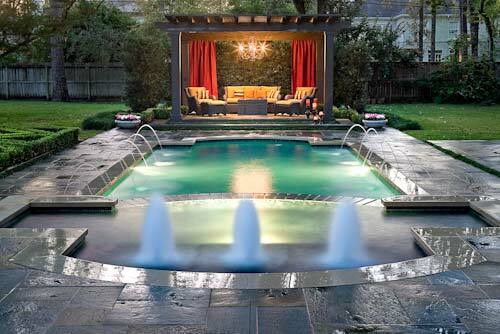 Red curtains frame the view of the Houston landscape for those within the arbor, and function as allure to those viewing the living room from other parts of the yard. The beams are made of solid steal and surrounded by pressure treated pine. They are stained to match the rest of the room’s interior. The roof is pitched slightly to run water backward to an organic wall of Japanese yew trees. This exposes the underbelly of the ceiling just a bit, making it appear to slope upwards. The slight tilt allows for a better view of the stars and the traditional-style home that looms majestically up from the Houston landscape and nighttime skyline. 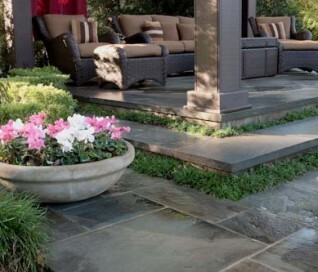 The floor of the arbor living room is made from the same sandstone used to build the pool patio. 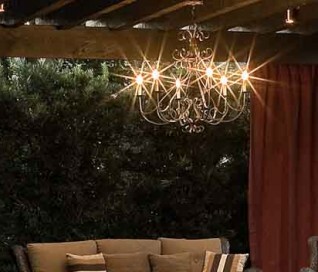 It has limestone inlays cut into it, which creates decoration and scaling, which looks great under chandelier light. 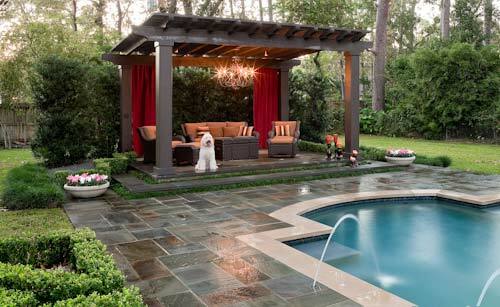 A few other features surrounding the arbor serve to enhance its preeminent position on the Houston landscape. The first of these are the sandstone steps that lead up to the arbor’s interior. 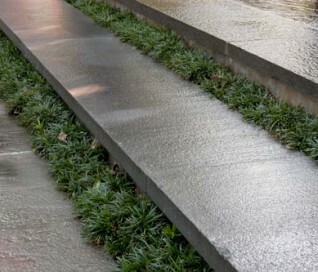 Each step is set on a concrete base hidden in the grass. 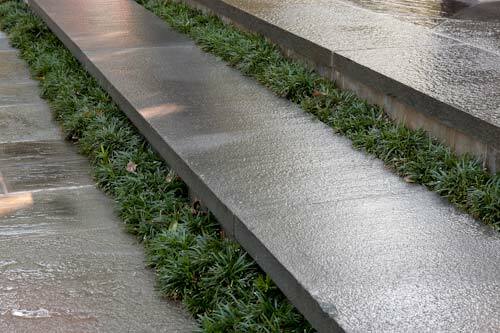 Sandstone risers support the 18-inch treads that measure two inches each in thickness. The treads are cut and thermal finished to give them a rich texture and sophisticated look. 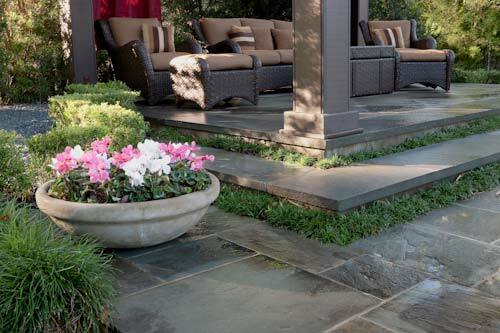 The generous width of each tread makes for a generous step and allows for a gradual descent to the upper pool terrace. Dwarf mondo grass clusters between the risers to compliment the yew backdrop at the rear of the arbor. Then, on either side, we find additional softscape elements that add vitality and décor to the sophisticated and complex hardscape designs that subdivide this massive Houston landscape into gathering points of interest and activity. To one side of the arbor lies a formal parterre garden, which runs parallel to the pool. Boxwoods frame the arbor to provide scaling, organic complimentary framing, and structure. A decorative planter housing Cyclamens adds color and vitality to the scene. Gravel to the rear of the boxwood line makes for low maintenance ground cover.